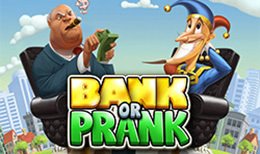 Get ready for a wild ride in Bank or Prank, a slot game filled with fun twists and turns on the reels that can either pay out big or end in a big joke! Collect mystery symbols and crazy wild symbols that launch special bonus features. The banker can pay you handsomely, but watch out for the bomb symbols that can bust your chances for a big win! There's never a dull moment in this creative game. Will you win the bank or will you get caught in a prank? Spin the reels and find out!